The Lenovo ThinkSystem DS2200 provides simplicity, speed, scalability, security, and high availability for small to large businesses. The ThinkSystem DS2200 delivers enterprise-class storage management technology in an affordable solution with a wide choice of host connectivity options, flexible drive configurations, and enhanced data management features. This product guide describes the Lenovo ThinkSystem DS2200 and provides essential pre-sales information to understand its structure, key features and specifications, components and options, and configuration guidelines. This guide is intended for technical specialists, sales specialists, sales engineers, and IT architects who want to learn more about the Lenovo ThinkSystem DS2200 and consider its use in IT solutions. The ThinkSystem DS2200 is a perfect fit for small offices and remote and branch offices of large enterprises that need a primary storage solution that supports general purpose workloads, such as file and print serving, web serving, email and collaboration, and small databases. The DS2200 is also well-suited for secure archive storage or a low-cost backup solution. The ThinkSystem DS2200 supports up to 96 drives with up to three external expansion enclosures. It also offers flexible drive configurations with the choice of 2.5-inch and 3.5-inch drive form factors, 10 K or 15 K rpm SAS and 7.2 K rpm NL SAS hard disk drives (HDDs) and self-encrypting drives (SEDs), and SAS solid-state drives (SSDs). The DS2200 can be scaled up to 1.47 PB of raw storage capacity. 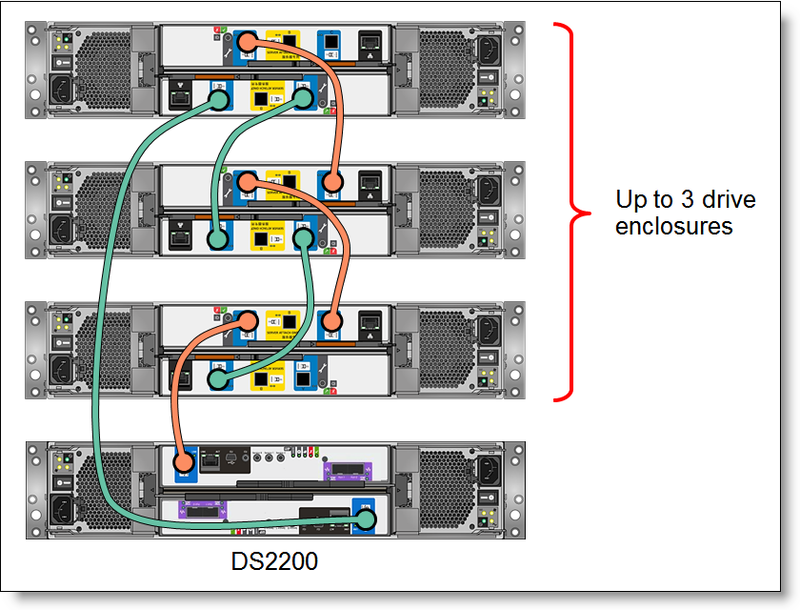 The Lenovo ThinkSystem DS2200 enclosures are shown in the following figure. The ThinkSystem DS2200 supports Intelligent Real-time Tiering capabilities that help optimize system performance, reduce costs, and simplify management. The base software includes the ability to move data dynamically between SAS HDDs that are optimized for cost per IOPS and NL SAS HDDs that are optimized for cost per GB. With the optional software license, the DS2200 supports hybrid tiering across HDDs and SSDs. The ThinkSystem DS2200 offers the flexible choice of 12 Gb SAS, 1/10 Gb iSCSI, and 4/8/16 Gb Fibre Channel (FC) host connectivity protocols. The Converged Network Controller (CNC) design of the DS2200 makes the selection of iSCSI or FC host connectivity as simple as attaching corresponding transceivers or Direct-Attach Copper (DAC) cables to the SFP/SFP+ ports on the controller module. The ThinkSystem DS2200 supports battery-free cache protection, which reduces maintenance costs and provides permanent backup of unwritten cache data if there is a power failure. Low-cost, entry-level storage with dual active/active controller configurations for high availability and performance. Flexible host connectivity to match diverse client needs with support for 12 Gb SAS (SAS controller module) or 1/10 Gb iSCSI or 4/8/16 Gb Fibre Channel connectivity (FC/iSCSI controller module). 12 Gb SAS drive-side connectivity with support for 12x 3.5-inch large form factor (LFF) or 24x 2.5-inch small form factor (SFF) drives in the controller enclosure; scalable up to 48 LFF drives per system with the attachment of ThinkSystem DS Series LFF expansion units (12x LFF drives each) or up to 96 SFF drives per system with the attachment of ThinkSystem DS Series SFF expansion units (24x SFF drives each) to satisfy growing needs for storage capacity and performance. Support for self-encrypting drives (SEDs) to allow clients to secure their sensitive data and to comply with various security regulations, when required. Rich set of standard functions available at no extra cost, including virtualized storage pools, snapshots, thin provisioning, rapid RAID rebuild, real-time HDD tiering, SSD read cache, and All Flash Array (AFA). Optional licensed functions, including higher number of snapshots for more scalability, real-time SSD tiering for boosting IOPS performance, and asynchronous replication for 24x7 data protection. Enhanced streaming performance for video surveillance and media/entertainment applications. Integration with Microsoft Volume Shadow Copy Services (VSS) to provide the backup infrastructure for Windows Server and a mechanism for creating consistent point-in-time copies of data (known as shadow copies). Intuitive, web-based GUI for easy system set up and management, as well as Command Line Interface (CLI). EZ Start configuration wizard to quickly provision storage by creating storage pools, allocating storage space, and mapping hosts in just a few simple steps. The ThinkSystem DS2200 supports the complete range of data storage requirements, from highly used applications to high-capacity, low usage applications. Up to three ThinkSystem DS Series expansion units are supported by a single ThinkSystem DS2200. Customers can intermix 3.5-inch and 2.5-inch expansion enclosures behind a 3.5-inch or 2.5-inch controller enclosure. This configuration delivers the added flexibility to mix 3.5-inch and 2.5-inch drives within a single system (but not within the enclosure). More drives and expansion enclosures are designed to be dynamically added with virtually no downtime, which helps to quickly and seamlessly respond to ever-growing capacity demands. The following figure shows the front of the ThinkSystem DS2200 SFF chassis and the DS Series SFF expansion unit. The following figure shows the front of the ThinkSystem DS2200 LFF chassis and the DS Series LFF expansion unit. The following figure shows the rear of the ThinkSystem DS2200 with SAS controller modules. The following figure shows the rear view of the ThinkSystem DS2200 with FC/iSCSI controller modules. The following figure shows the rear of the ThinkSystem DS Series expansion unit. Note: Port B on the DS Series expansion unit is not used. The following table lists the ThinkSystem DS2200 specifications. RAID levels RAID 1, 5, 6, and 10; Rapid Data Protection Technology (ADAPT). Controller memory 16 GB per system (8 GB per controller module). Battery-free cache protection with flash memory and supercapacitors. Low latency cache mirroring protection for dual controller configurations. Drive technology SAS and NL SAS HDDs and SEDs, SAS SSDs. Intermix of HDDs and SSDs is supported. Intermix of SEDs with HDDs or SSDs is not supported. 3x 12 Gb SAS x4 (Mini-SAS HD SFF-8644) expansion ports; two of these ports (Ports A and C) are used for the daisy chained attachment of the expansion enclosures; Port B is not used. Storage capacity Up to 1.47 PB (96x 15.36 TB 2.5-inch SAS SSDs). Host operating systems Microsoft Windows Server 2012 R2, 2016, and 2019; Red Hat Enterprise Linux (RHEL) 6 and 7; SUSE Linux Enterprise Server (SLES) 11, 12, and 15; VMware vSphere 5.5, 6.0, 6.5, and 6.7. Standard software features Intelligent Real-time Tiering for HDDs, Virtualized Storage Pools, Thin Provisioning, SSD Read Cache, Rapid RAID Rebuild, Snapshots (up to 128 targets), All Flash Array. Optional software features Intelligent Real-time Tiering for SSDs, Snapshots (up to 1024 targets), Asynchronous Replication. Cooling Redundant cooling with two fans built into power and cooling modules (PCMs). Power supply Two redundant hot-swap 580 W AC power supplies built into PCMs. Hot-swap parts Controller modules, expansion modules, SFP/SFP+ transceivers, drives, PCMs. Management interfaces 1 GbE port (UTP, RJ-45) and serial port (Mini-USB) on the controller modules. Security features Secure Socket Layer (SSL), Secure Shell (SSH), Secure FTP (sFTP), Self-encrypting drives (SEDs). Warranty Three-year customer-replaceable unit and onsite limited warranty with 9x5 next business day response. Optional warranty service upgrades are available through Lenovo: Technician Installed Parts, 24x7 coverage, 2-hour or 4-hour response time, 6-hour or 24-hour committed repair, 1-year or 2-year warranty extensions, YourDrive YourData, installation services. The following table lists the relationship models of the ThinkSystem DS2200. The following table lists the TopSeller models of the ThinkSystem DS2200. The following table lists the CTO base models for the ThinkSystem DS2200. For Relationship and TopSeller models, two DS2200 FC/iSCSI or SAS Controller Modules are included in the model configuration. For CTO models, two DS2200 FC/iSCSI Controller Modules (feature code AU2G) or DS2200 SAS Controller Modules (feature code AU2F) must be selected during the configuration process, and both modules must be of the same type - either FC/iSCSI or SAS (mixing of FC/iSCSI and SAS controller modules is not supported). Lenovo Storage 12Gb SAN Rack Mount Kit - Rails 25"-36"
DS2200 SAS Controller Modules provide direct SAS attachment for up to two hosts with a supported SAS HBA installed. Each DS2200 SAS Controller Module has two 12 Gb SAS ports with Mini-SAS HD (SFF-8644) connectors. DS2200 FC/iSCSI Controller Modules provide SAN based iSCSI or FC connectivity to the hosts with a supported software initiator or HBA installed. Each DS2200 FC/iSCSI Controller Module has a built-in Converged Network Controller (CNC) that has two SFP/SFP+ ports. 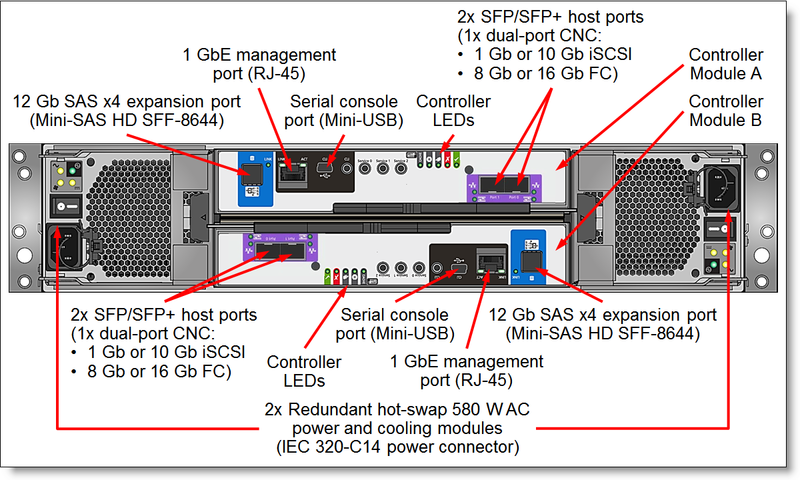 Both ports on the CNC on the DS2200 FC/iSCSI Controller Module must have the same connectivity type (the same type of SFP/SFP+ modules or DAC cables). Both controller modules in the system must be of the same type, and they must have matching port configurations (that is, the ports on both DS2200 FC/iSCSI controller modules must have SFP/SFP+ modules of the same type). SAS controller modules and FC/iSCSI controller modules have one 12 Gb SAS x4 expansion port (Mini-SAS HD SFF-8644 connector) for the attachment of the ThinkSystem DS Series expansion units. The following table lists the controller modules and supported connectivity options. ^ Factory-installed only, no field upgrade. Relationship models include two controller modules. CTO models require the selection of two controller modules. * Up to two SFP/SFP+ modules per controller; the modules must be of the same type. ** Up to two cables per controller. *** Up to three cables per controller: one cable for 1 GbE management port connection; up to two cables for CNC port connections with 1G RJ-45 modules attached. The ThinkSystem DS2200 can be upgraded to ThinkSystem DS4200 or DS6200 functionality by replacing the DS2200 controller modules with the DS4200 or DS6200 controller modules during a planned offline maintenance window without the need to migrate or move data. The following table lists the upgrade kit options. Upgrade kits contain two controller modules, a label sheet, and upgrade instructions. The upgrade instructions cover the upgrade process that uses the controller modules of the same type: SAS to SAS or FC/iSCSI to FC/iSCSI. It is allowed to perform SAS to FC/iSCSI or FC/iSCSI to SAS upgrade, however, this process requires significant changes in the external connectivity topology and is beyond the scope of the upgrade instructions provided. Upgrade kits are for field upgrades of the DS2200 controller enclosures; expansion enclosures cannot be upgraded. Only DS2200 SFF controller enclosures can be upgraded to DS6200. The majority of the system configuration information is not saved during the upgrade process, including license keys, and these settings need to be restored/re-configured manually. SFPs are not included with the FC/iSCSI upgrade kits; re-use the SFPs from the existing DS2200 FC/iSCSI controller modules or purchase required SFPs from Lenovo. The system model will change to DS4200 or DS6200, however, the machine type of the controller enclosure will not change (MT 4599). The ThinkSystem DS2200 supports attachment of up to three ThinkSystem DS Series expansion enclosures. Intermix of LFF and SFF enclosures is supported. The enclosures can be added to the system non-disruptively. The following table lists the relationship models of the ThinkSystem DS Series expansion enclosures. The following table lists the CTO base models for the DS Series Expansion Units. For Relationship models, two SAS I/O expansion modules are included in the model configuration. For CTO models, two SAS I/O expansion modules (feature code AU2K) must be selected during the configuration process. Each ThinkSystem DS Series Expansion Unit ships with two SAS I/O expansion modules. 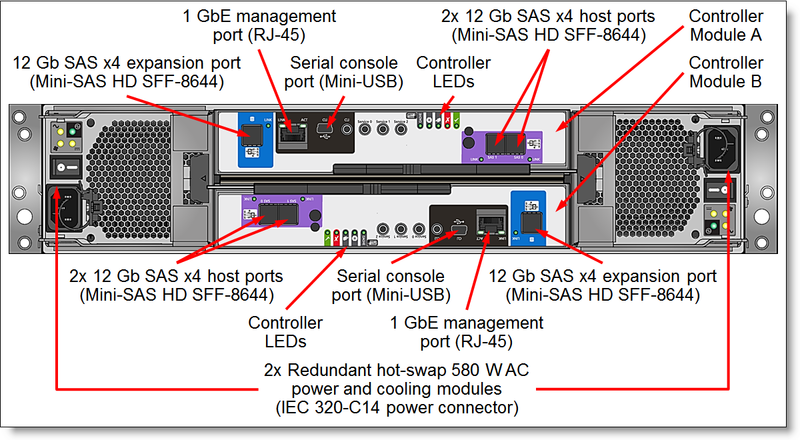 Each expansion module provides 12 Gb SAS connectivity to the internal drives, and it has three external 12 Gb SAS x4 ports (Mini-SAS HD SFF-8644 connectors labelled Port A, Port B, and Port C) that are used for connections to the ThinkSystem DS2200 and for daisy chaining the expansion enclosures between each other. The expansion port on the first controller module is connected to the Port A on the first expansion module in the enclosure, and the Port C on the first expansion module in the enclosure is connected to the Port A on the first expansion module in the adjacent enclosure, and so on. The expansion port on the second controller module is connected to the Port C on the second expansion module in the enclosure, and the Port A on the second expansion module in the enclosure is connected to the Port C on the second expansion module in the adjacent enclosure, and so on. Note: The Port B on the expansion module is not used. The expansion enclosure connectivity topology is shown in the following figure. The following table lists ordering information for the supported expansion enclosure connectivity options. * One cable per expansion module; two cables are required per each expansion enclosure. The ThinkSystem DS2200 SFF chassis and the DS Series SFF expansion enclosures support up to 24 SFF hot-swap drives, and the ThinkSystem DS2200 LFF chassis and the DS Series LFF expansion enclosures support up to 12 LFF hot-swap drives. The following table lists supported drive options for the DS2200 SFF chassis and the DS Series SFF expansion enclosures. The following table lists supported drive options for the DS2200 LFF chassis and the DS Series LFF expansion enclosures. Intelligent Real-time Tiering for HDDs: Storage tiering helps optimize storage use with intelligent data placement to improve system performance, reduce costs, and simplify management. The DS2200 automatically and dynamically moves frequently accessed data to higher performing HDDs in the system without manually creating and managing storage tier policies. All Flash Array (AFA) capability: Meets the demand for higher speed storage and provide higher IOPs and bandwidth with lower power usage and total cost of ownership than hybrid or HDD-based solutions. Rapid Data Protection Technology (ADAPT): Helps improve performance and availability with significantly faster rebuild time and built-in spare capacity by allowing data to be distributed across all physical drives in the storage pool (drives do not need to be of the same capacity) and sustaining up to two concurrent drive failures. RAID levels 1, 5, 6, and 10: Provide the flexibility to choose the level of data protection required. Virtualized storage pools: Enables rapid, flexible storage provisioning and simple configuration changes. Stored data is distributed across all drive groups in the pool (wide striping) which helps improve performance, lower latency, and achieve higher volume capacities. When a new drive group is added to the pool, the system performs automatic rebalancing to utilize all drives in the pool for better performance. Thin provisioning: Optimizes efficiency by allocating drive storage space in a flexible manner among multiple applications, based on the minimum space required by each application at any given time. With thin provisioning, applications consume only the space they are actually using, not the total space that has been allocated to them, which allows clients to purchase storage they need today and add more as application requirements grow. Snapshots: Enables creation of copies of data for backup, parallel processing, testing, and development, and have the copies available almost immediately. Base software supports up to 128 snapshot targets per system. The ThinkSystem DS2200 capabilities can be expanded with optional licensed functions. Intelligent Real-time Tiering for SSDs: The SSD tiering upgrade option allows the use of SSDs as read and write storage in the hybrid HDD and SSD storage configurations. Also, this option makes it easy and economical to deploy hybrid storage by dynamically moving frequently accessed data to SSDs in the system, resulting in flash drive performance without manually creating and managing storage tier policies. Snapshots upgrade: The snapshot upgrade options increase the supported number of snapshot targets to 512 or 1024 per system. Asynchronous Replication: The asynchronous replication feature provides storage system-based data replication between primary (local) and secondary (remote) systems by using asynchronous data transfers over IP (iSCSI) or Fibre Channel communication links. The secondary system can be a replication target for up to four primary systems. The replication is performed manually or at predetermined schedule with at least 60 minutes between consecutive runs. For ultimate flexibility, DS2200 asynchronous replication interoperates with the ThinkSystem DS4200 and DS6200, as well as Lenovo Storage S2200 and S3200. The asynchronous replication option must be acquired (or licensed) for both primary and secondary systems. The following table lists the Feature on Demand (FoD) upgrades for the ThinkSystem DS2200 to enable optional software features. Each optional DS2200 function is licensed on a per-system basis and covers both controller enclosure and all attached expansion units. The SSD Data Tiering Upgrade option is not required for all flash array configurations (a storage system with SSDs only; no HDDs installed) and for hybrid configurations (a storage system with SSDs and HDDs) in which SSDs are used exclusively for SDD read cache; however, it is required for any other hybrid configuration (a storage system with SSDs and HDDs) even when the SSD storage tiering is not used. Asynchronous Replication requires an FC/iSCSI Controller-based DS2200 storage unit. Software maintenance for standard software features is included in the ThinkSystem DS2200 base warranty and optional warranty extensions, which provides 3-year software support with the option to extend it up to 5 years in 1-year or 2-year increments (see Warranty services and upgrades for details). Optional software features include 3-year software maintenance with the ability to extend it up to 5 years in 1-year or 2-year increments with the purchase of the software maintenance extension options that are listed in the following table. Note: The ThinkSystem DS2200 must have active warranty coverage for the duration of an intended software maintenance extension period. Lenovo Storage Management Console (SMC), a web-based interface (WBI) via HTTP, that requires only a supported browser (Microsoft Internet Explorer, Google Chrome, or Mozilla Firefox), so there is no need for a separate console or plug-in. Command line interface (CLI) via Telnet or SSH or through Direct Connect USB. Note: Direct Connect USB may require device drivers on the connected computer that uses older Windows operating systems. Drivers are provided on the Lenovo support site, if needed. Optional Lenovo XClarity for discovery, inventory, monitoring, alerts, and firmware updates. The ThinkSystem DS2200 and DS Series enclosures have two redundant hot-swap 580 W AC power supplies, each with an IEC 320-C14 connector. The relationship models of the ThinkSystem DS2200 and DS Series enclosures ship standard with two 1.5m, 10A/100-250V, C13 to IEC 320-C14 rack power cables. The CTO models require the selection of two power cables. The part numbers and feature codes to order the power cables are listed in the following table (two power cables should be ordered per each enclosure, if needed). The ThinkSystem DS2200 and DS Series enclosures have a three-year customer-replaceable unit (CRU) and onsite (for field-replaceable units [FRUs] only) limited warranty with standard call center support during normal business hours and 9x5 Next Business Day Parts Delivered. Premier Support service offers single point of contact for end-to-end problem resolution and collaborative third-party software support with direct access to Lenovo’s most advanced technicians for faster troubleshooting. Lenovo provides end-to-end storage compatibility testing to deliver interoperability throughout the network. The ThinkSystem DS2200 supports attachment to Lenovo ThinkSystem, System x, ThinkServer, and Flex System hosts by using SAS, iSCSI, or Fibre Channel storage connectivity protocols. Note: Tables that are provided in these sections are for ordering reference purposes only. End-to-end storage configuration support must be verified through the Lenovo ThinkSystem DS2200 Interoperability Matrix. 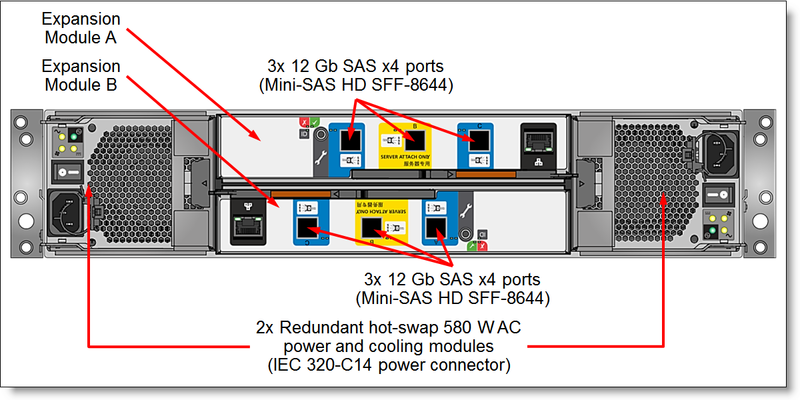 The following table lists currently available SAS adapters for Lenovo servers that are compatible with the ThinkSystem DS2200 SAS storage (direct attach). The ThinkSystem DS2200 supports iSCSI attachments via standard 1 Gb or 10 Gb Ethernet connections (direct or switch-based). Any compatible Ethernet switch, including Lenovo ThinkSystem and RackSwitch Ethernet switches and integrated Flex System Ethernet I/O modules, can be used to provide iSCSI connectivity for the ThinkSystem DS2200 storage. With software iSCSI initiators, any supported 1 Gb Ethernet or 10 Gb Ethernet adapter for Lenovo servers is compatible with the ThinkSystem DS2200 iSCSI storage. Currently available converged iSCSI adapters for Lenovo servers that are compatible with the ThinkSystem DS2200 are listed in the following table. Other converged iSCSI HBAs also might be supported (see the Interoperability Matrix for details). The ThinkSystem DS2200 supports direct FC attachments and FC switch-based attachments. Lenovo B Series and DB Series FC SAN switches and directors can be used to provide FC connectivity. Currently available FC adapters for Lenovo servers that are compatible with the ThinkSystem DS2200 FC storage are listed in the following table. Other FC HBAs also might be supported (see the Interoperability Matrix for details). The following table lists currently available Ethernet rack-mount switches that are currently offered by Lenovo that can be used with the ThinkSystem DS2200 for iSCSI storage connectivity. The following table lists currently available Ethernet embedded switches and pass-thru modules for Flex System that can be used with the ThinkSystem DS2200 for iSCSI storage connectivity. The following table lists currently available Fibre Channel rack-mount switches that are currently offered by Lenovo that can be used with the ThinkSystem DS2200 for FC SAN storage connectivity. The following table lists currently available Fibre Channel embedded switches and pass-thru modules for Flex System that can be used with the ThinkSystem DS2200 for FC SAN storage connectivity. The following table lists the rack cabinets that are currently offered by Lenovo that can be used for mounting the ThinkSystem DS2200 and other IT infrastructure building blocks. The following table lists the power distribution units (PDUs) that are currently offered by Lenovo that can be used for distributing electrical power to the ThinkSystem DS2200 and other IT infrastructure building blocks mounted in a rack cabinet. The following table lists the uninterruptible power supply (UPS) units that are currently offered by Lenovo that can be used for providing electrical power protection to the ThinkSystem DS2200 and other IT infrastructure building blocks. Internet Explorer®, Microsoft®, Windows Server®, and Windows® are trademarks of Microsoft Corporation in the United States, other countries, or both.